Krzysztof Wieliski was born on 5 January, 1950. He is engineer of electronic. Today he is CEO of company which distribute outdoor goods (for example Grivels) in Poland. He started climbing in Sokoliki Mountains in Poland when he was 20 years old. In Tatras he climb from 1970 (summer and winter. New routes on Jastrzębia Turnia and Jaworowy Szczyt. First winter ascents on Kazalnica Mięguszowiecka (the hardest Polish winter wall)). In Alps he climb on Punta Civetta, Pan di Zucchero and Punta Tissi. In Caucasus on Kosztan-tau, Dych-tau and Krumkol. In Hindu Kusk he do new route on Szachaur. In 1978 he start mountaineering in Himalays (ascent on Annapurna South). on 17 February, 1980 with Leszek Cichy, made first winter ascent on Mount Everest. That was also first ever winter ascent on 8000 meter peak. After that Krzysztof Wielicki also completed all fourteen eight-thousanders. Some of them in winter, some by new routes. He need fot this 16 years. 17 February, 1980 - Mount Everest, normal route from Nepal. First winter ascent (! ), also first ever winter ascent of a summit ofa a 8000 meter peak. Team: Leszek Cichy, Krzysztof Wielicki. 14 July, 1984 - Broad Peak, normal route, solo. First - ever - ascent on 8000 meter peak in 24 hours (16 hours up, 6 hours down). After this ascent climbers from base do a nickname for Wielicki: "Flying Horse". 20 October, 1984 - Manaslu, new route on SE face. Team: Aleksander Lwow. 11 January, 1986 - Kangchenjunga, normal route. First winter ascent. Team: Jerzy Kukuczka, Krzysztof Wielicki. 24 September, 1986 - Makalu, SW ridge and N face. New variation on French Route. Team: Marcel Rüedi, Krzysztof Wielicki. 31 December, 1988 - Lhotse, W face (normal route), solo. First winter ascent. 24 April, 1990 - Dhaulagiri, new route on E face, solo (16 hours from base to peak). 21 October, 1991 - Annapurna, by British route on S face. Team: Bogdan Stefko, Krzysztof Wielicki. 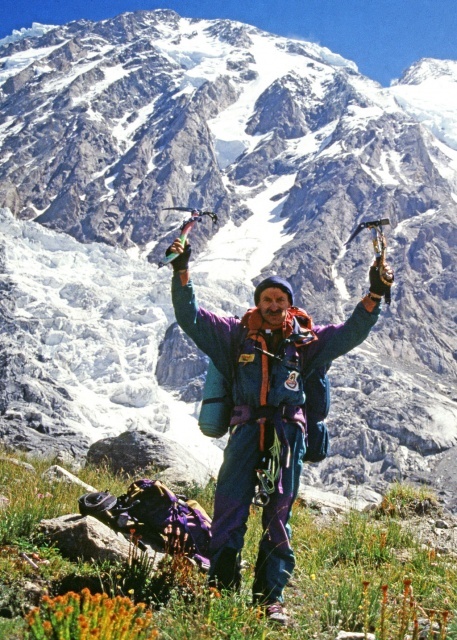 1992 - Manaslu, normal route. Team: Marco Bianchi, Christian Kuntner, Krzysztof Wielicki. 18 September, 1993 - Cho Oyu, by Polish route. Team: Marco Bianchi, Krzysztof Wielicki. 7 October, 1993 - Shisha Pangma, new route on S face, solo. 9 July, 1995 - Gasherbrum II, normal route, solo. 15 July, 1995 - Gasherbrum I, Japan route, alpine style. 30 hours from base bo peak. Team: Jacek Berbeka, Carlos Carsolio, Krzysztof Wielicki, Ed Viesturs. 26 July, 2006 - Gasherbrum II. Team: Rafał Fronia, Robert Jucha, Paweł Podsiadło, Krzysztof Wielicki, Zbigniew Zimniewicz.